Downey police Officer Ricardo Galvez was fatally shot in the parking lot of the Downey Police Department in the 10900 block of Brookshire Avenue on Wednesday, Nov. 18, 2015. 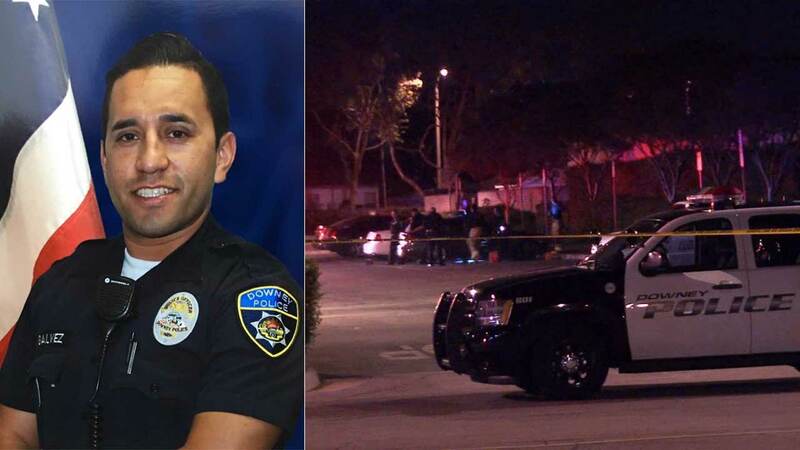 DOWNEY, Calif. -- A Downey police officer whose body was found in the west parking lot of the Downey Police Department Wednesday night was killed in a botched robbery attempt, according to Lt. John Corina. Ricardo "Ricky" Galvez, 29, of Whittier, was found dead inside his own car at the end of his shift in the 10900 block of Brookshire Avenue shortly after 11 p.m.
Corina said at least two suspects walked up to Galvez's car as he sat in the driver's seat, and the two opened fire. The suspects were not aware that Galvez was a police officer because he was in plain clothes. A fellow Downey police officer heard the gunshots and chased the suspects to the neighboring city of Montebello, where the suspects bailed on foot near Washington Boulevard and Carob Way. "As luck would have it, a Downey police officer in his patrol vehicle heard the shooting, went in pursuit of the suspects, chased them into the city of Montebello, and that's where they bailed out of the car," Corina said. As of noon, two adult suspects in their 20s and one juvenile were arrested. All three suspects will be facing murder charges, Corina said. A revolver used in the incident was also recovered, Corina said. Authorities taped off the entire parking lot area, and Downey police officers at the scene appeared to be emotionally shaken. Galvez had been with the Downey Police Department for five years and had served as a U.S. Marine for two tours, Downey police Chief Carl Charles said at a news conference. Galvez was as "a tremendous young man who loved serving the residents of Downey," Charles said. "His smile was infectious, and his professionalism was always on display." Fellow colleagues paid respect to the slain officer as they guided his coffin from the crime scene to the coroner's office. Gov. Jerry Brown ordered Capitol flags to be flown at half-staff in honor of Galvez. "Anne and I were saddened to learn of the death of Officer Galvez and extend our condolences to his family, friends and the entire law enforcement community in this difficult time," Brown said in a statement. During the search for the suspects, a large perimeter was set up and evacuations were ordered in the Montebello area where they had fled from police. Resident Victor Bocanegra said police knocked on his door shortly after 2 a.m. and escorted his family out to the street. "They've evacuated some buildings and some townhomes, and they're looking for this suspect that killed a police officer," he said. Bocanegra said he saw police put at least two people into patrol cars and drive away. One of the three suspects was immediately arrested after bailing from the getaway car. The other two suspects were arrested during the search in Montebello, authorities said during a Thursday press conference. Washington Boulevard was closed between Paramount Boulevard and Greenwood Avenue for several hours.